For the Graduates: We ensure that every graduate receives two (sometimes three) complimentary proofs of different poses. These proofs are emailed and physically mailed home to each graduate. There is no charge to the school or graduate for providing these proofs. There is absolutely no obligation to purchase prints. After the ceremony, we photograph loads of friends and family candids with the graduates, which will also be made available. We usually have as much fun as the graduates when covering these candids! For the School: The second advantage is how this service helps preserve the dignity of the ceremony by keeping anxious parents in their seats instead of lobbying for a position to shoot from as their graduate crosses the stage. Therefore our presence allows parents to sit back and enjoy the ceremony knowing there will be professional quality photos of their loved one available to them. Lastly, the school appreciates our participation because we are so well organized and always arrive a full hour early, carrying archival notes and photos of their past ceremonies. 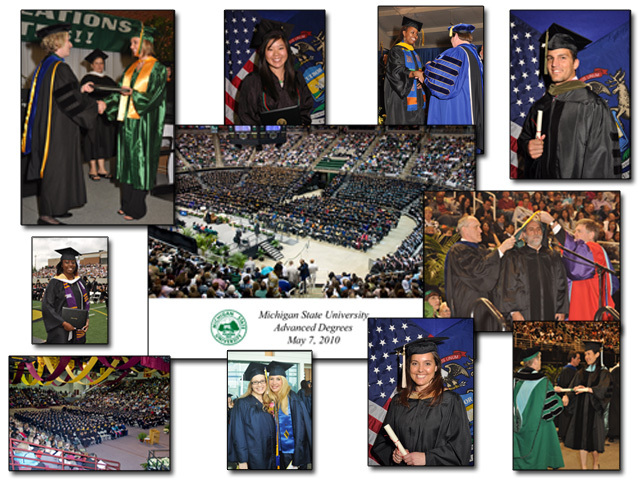 We pioneered commencement photography in the state of Michigan. We have photographed over 3.7 million graduates at nearly 11,000 graduation ceremonies in our 40 years. Our service is simple, professional and most importantly, flawlessly integrated into your commencement ceremony. Because of our years of experience, we can be a great resource for planning commencements and continually encourage our schools to use this to their advantage.